Customer-focused Extranets for FabTime Inc.
"EditMe is a good solution for us because 99.99% of the time, it just works and we don't have to think about it." 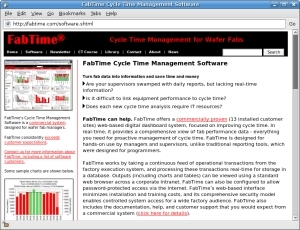 FabTime Inc. creates cycle time management software for semiconductor wafer fabrication facilities. They needed a simple way to collaborate with customers on software projects. EditMe provided an affordable, secure and reliable platform that everyone could use. When seeking a web-based project collaboration solution, FabTime needed something light and flexible that didn't require a lot of maintenance. "We needed an easy way to manage and share support-related items for our software customers: project lists, checklists, technical documentation, installation files, etc. It seemed like a wiki would fit our needs, but we didn't want the time and complexity of installing, troubleshooting, and upgrading the wiki software," explains Chance. "We chose EditMe because a) it fit our security requirements; b) it was quick and inexpensive to try out; and c) the user interface was easy to use and explain to others." FabTime Inc. uses one EditMe site for each customer project, making it easy to manage the life cycle of the project site around the life of the project. "We setup a new site for a customer and email them once with instructions, and they are able to start using it immediately," explains Chance. Another hub site manages internal communication and links to each of the individual project sites. EditMe's web-based account management software makes the creation and management of sites easy with instant access to newly created sites and combined billing for all the FabTime, Inc. sites. "We have a number of project sites hosted by EditMe, and it continues to be a very good value for us," says Chance. "Security and reliability are essential to us"
When considering a hosted solution, security, reliability and long-term stability were concerns for Chance. "Security and reliability are essential to us - we are constantly accessing the sites, and if there is a technical problem it causes big delays for us. We have been pleasantly surprised by the frequency of upgrades and the level of technical support. Once or twice we have considered hosting our own wikis, but we are very glad we decided to stick with EditMe." "We have been a satisfied EditMe customer since 2004"
FabTime Inc. is one of EditMe's longest held customers, and they have stuck with us even through some tough times. Frank Chance explains, "when EditMe had trouble with one ambitious software upgrade several years ago (which can happen to anyone), they recognized the problem, apologized, and rolled back to the previous stable release right away. What we learned from that case was that EditMe treats their customers well even when things aren't going smoothly, and that is important to us. We have been a satisfied EditMe customer since 2004." FabTime Inc. is the first company to focus solely on the challenging problem of cycle time management for semiconductor wafer fabrication facilities. FabTime believes that the cycle time problems faced by wafer fabs are uniquely difficult and that its customers will be well-served by a company that declares its focus and sticks to it. To that end, FabTime offers cycle time management software and training, as well as a newsletter dedicated to discussing best practices for fab cycle time improvement. FabTime's management team has been working with fabs since 1993. The company is based in San Jose and San Luis Obispo, California.